**ARC courtesy of Diversion Books via NetGalley in exchange for an honest review**Unfortunately, this was my first DNF :( WARNING: Minor spoilers in this reviewWhen I first read the book blurb for Stalking Sapphire, I was intrigued. It is the story about Sapphire, a rich, twenty something, socialite that has a very unique hobby. She hunts, captures, and turns known serial killers into the police. She is basically a vigilante as the police only become involved after she captures the killers and then directs the police to their location. Sapphire works very hard to ensure that no one suspects that she is the person behind catching all the serial killers. In order to hide her identity, she creates a persona based on what society expects from her: a wealthy, dumb, socialite.What I liked*Overall, I thought this was a well written story. 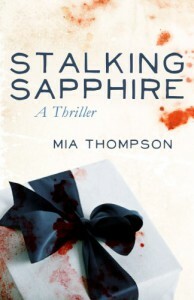 I thought the murder/mystery plot was well developed and kept me guessing as to who is stalking Sapphire. What Ruined the Book for Me*Pretty much EVERY SINGLE CHARACTER! While Sapphire seemed to be a strong and intelligent heroine, I didn't understand her reasoning at all. For example, she pretty much hates everyone in her life. She thinks that she is surrounded by wealthy, idiotic, self centered people but feels that she has to associate with them to keep up the appearance that she lives a normal life so no one suspects that she's the killer catcher. She's over 20 years old, lives with her mother, doesn't go to college, and doesn't have a job. To me, it would make more sense that she went to college, made some real friends, and eventually got a job in law enforcement since she likes to solve crimes. That would still give her the appearance of living a normal life while also making her happy as a person. And that lifestyle would be more low key than hanging out with people who are constantly in the media or are well known by the general public. Another thing I disliked about Sapphire is that she is SUPER SELFISH! For example: She was basically raised by her nanny/housekeeper Julia and they have a very close relationship. During the book, Julia announces that her boyfriend proposed and Sapphire threw a hissy fit because she didn't want Julia to move on and make a new life with her husband and future children and leave her behind. That reasoning is totally immature! Just because Julia gets married doesn't mean she will stop being there for Sapphire! I guess I just couldn't connect with this character because I didn't understand her reasoning for pretty much everything. The other main character, Aston, who I think is supposed to be a love interest for Sapphire, also annoyed me. A few words to describe Aston: womanizer, alcoholic, arrogant, rude, and just plain stupid sometimes... and none of these characteristics are even close to the hot, bad boy types that I love in other books. He speaks without thinking all the time. I couldn't believe how rude and disrespectful he was toward his bosses! In real life, if anyone acted the way Aston did, they would have been fired on the spot. I guess there just wasn't anything I liked about Aston.. not one redeeming quality :(Overall, I just couldn't get into the plot because I did not connect with the characters at all. I figured I would cut my losses at 57% and start a new book since I was basically to the point where reading this book became a chore for me.